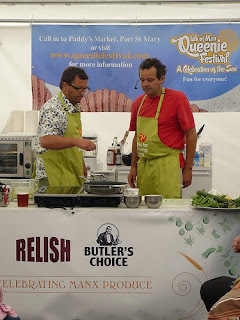 Relish: Queenie Festival....including celeb chefs woohoooo! Queenie Festival....including celeb chefs woohoooo! Queenie Festival 09 was a great success. I was taking care of the Food Theatre where we had a load of queenie/seafood demos. A big thank you to Butlers Choice (ask for Sue on 614805) for sponsoring the demo kitchen, they provided Global knives (yes, you should be jealous), Le Creuset pans, Induction hobs and loads more. On stage we had Mitch Tonks and Mark Hix, top seafood chefs from the UK. There are loads of photos here on flickr. 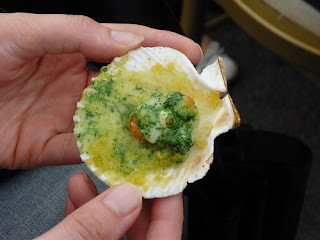 We also had Joan from Tanroagan showing us Queenie Pie with samphire, Anne from The Wine Cellar matching wine and seafood, Paul from Moore's smokehouse with his kippers and crab, plus the Laxey School recipe book crew including their star chef Richard.